The Eltron P420 C has been renamed to the Zebra P420 C.
For high volume printing of double-sided plastic cards in color. The P420 C plastic card printer is highly versatile, and designed for high volume printing of double-sided plastic cards in color. The P420 C's rugged, all metal enclosure houses a low-maintenance print mechanism that includes self-cleaning card handling, high capacity ribbon system, two-line LCD control panel, and convenient card reject hopper. The reject hopper separates cards that fail encoding prior to printing, saving valuable printer ribbon. 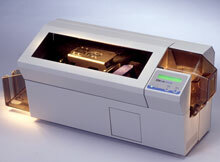 The enclosure includes a viewing window to monitor the printing process without opening the unit. Transparent input and output hoppers provide visual card capacity status. All units ship with product documentation. Thermal transfer, 300 dpi, 102 cards per hour, parallel interface, color printing, 4MB RAM. Includes tracks 1, 2 & 3 magnetic stripe encoder, smart card contact station & US power cord. Order cables separately. See accessories. Thermal transfer, 300 dpi, 102 cards per hour, parallel interface, color printing, 4MB RAM. Includes US power cord. Order cables separately. See accessories. Thermal transfer, 300 dpi, 102 cards per hour, parallel interface, color printing, 4MB RAM. Includes tracks 1, 2 & 3 magnetic stripe encoder & US power cord. Order cables separately. See accessories.